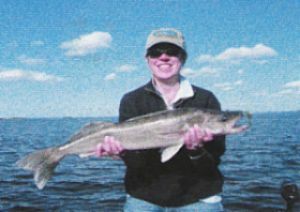 Walleye (Pickeral) and Sauger Fishing on Lake of the Woods, ZONE 5, is closed from April 15th - the 3rd Saturday in May. Walleye represent the essence of fishing in Ontario. Lake of the Woods is a prime habitat for this tasty fish, which makes it one of the best locations in North America for the Walleye angler to come and enjoy fishing at it’s best. Sauger are also a popular fish that are often mistaken for Walleye, and are just as much fun to catch. Lake of the Woods Walleye fishing is outstanding! 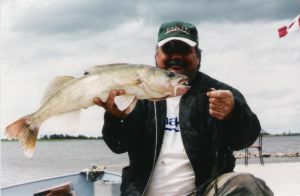 Walleye are the number one primary fish on Lake of the Woods, and the most sought after fish. Walleyes are native species to Lake of the Woods with it’s 65,000 miles of shoreline, over 14,000 islands. Walleyes are the most popular game fish in Lake of the Woods, as their mild fillets are prized for shorelunches. They average about 2 - 3 pounds but grow to well over 10 pounds. 5 - 6 pounders are very common on this lake. For non-residents the Walleye & Sauger limit with a full sport license is two a day and 4 in possession (over 2 days or to take home). With a conservation license the Walleye/Sauger fishing limits are two a day and two in possession. You can only keep one walleye over 18.1 inches long. In the spring, after they spawn, they are found along boulders and sand shorelines. The most successful approach to catching walleye in early spring is using a 3/8 oz jig tipped with a minnow. Fishing shorelines in 1-7 feet of water using a jig and minnow or jig and a leech is very effective. Another successful technique is shallow water crank baits eg (storm hot and tots, rapala, husky jerks, rapala shad rap, mepps spinners. Gold spinners always seem to be successful. Over the summer the walleyes move. For a short time while the weather changes they can be caught along weed beds and in the Bay right in front of the Lodge. This is generally in mid June to mid July, depending on the year and the weather. Usually by the end of June or mid July they start to show up on the reefs where they can be caught through August or September. Summer time walleye fishing is typically done on reefs or humps at 15' to 30'. We find using a jig and a minnow with a snap swivel or barrel swivel technique the most effective. Try 3/8 oz or 1/2 oz Jigs or spinners tipped with bait are the most common lures. They love live minnows, worms and leeches. Gold is usually the main color they prefer. Fall walleye fishing often resembles spring fishing, as Walleye move just off their spring shallow spots to bays and inlets. Again the most effective technique is a jig and a minnow. For Walleye and Sauger, always fish on the bottom or within a few feet off the bottom of the lake. Whether it’s a trophy fish you’re after, or just want to catch enough for a delicious Canadian shore lunch, we can help you find that perfect Lake of the Woods Walleye fishing spot. The Master Angler Award program recognizes the efforts of fishermen catching Walleye 25" and over. This is another one of the 30 inch Master Anglers caught here. 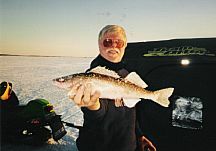 We specialize in Lake of the Woods Walleye Fishing. Fishing for Walleye and Sauger is great. 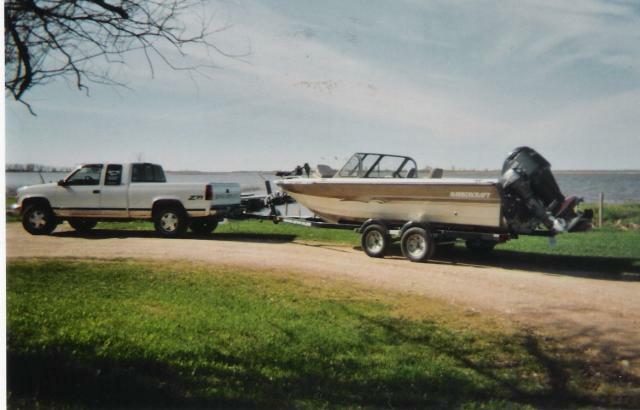 Great Boat for Lake Tours & Guided Fishing Vacations no matter what the weather is like. Here is our new 1925NE Harbercraft guide boat. Great for guided fishing trips and lake tours.